If you happen to be driving through the farm fields of Yomitan, you might notice an American guy feeding his Japanese Wagyu cattle - a special breed of cow that is used for Japan's famous Kobe beef. Like his Okinawan counterparts, this American cattle raiser takes his work seriously, and he knows as much about Wagyu cattle raising as anyone in the business. Read More! One of the island’s major summer events is the “Orion Beer Fiesta,” scheduled this year for Saturday and Sunday at the Onoyama Park in Naha City. But unlike previous years the 1999 extravaganza will not only be limited to the main island and can be enjoyed at four locations, including Ishigaki and Miyako islands. Read More! From the humble beginnings of pioneering DJ’s Grand Master Flash and Kool Herc carrying crates of records to the parks in New York City in the early1970’s, to the success of gold certified mix CD’s from DJ Funkmaster Flex, the art of DJing has indeed gone global. Once considered as a novelty, some of today’s hottest DJ’s are widely embraced and experience cult-like followings, which has helped catapult them to rock star like status. Read More! Okinawa will host for the first time an “ultimate” style fighting event featuring some of the world's best international fighters. Local promoter Masaaki Asato and organizer Eddie Erazo will debut Kakidamishi: The Samurai Challenge on Sunday, July 11, an event set to showcase several world class kickboxing matches. Read More! 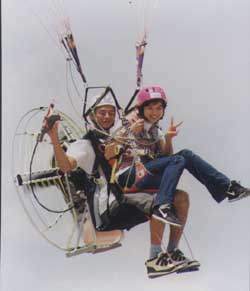 Okinawa is a paradise for outdoor sports enthusiasts. The island's pristine ocean provides a fabulous playground for divers and kayakers, while its mountains and rivers serve as a haven for mountain bikers and hikers. Read More! Looking to take your underwater photography skills to a higher level? Maybe you're an avid snorkeler with an eye for that “great shot,” who from time to time can capture a fantastic underwater image. If you think you have what it takes, get yourself over to the Kadena Marina and register for the "Kadena Marina Underwater Photo Contest," scheduled for July 17 and 18. Read More! July 7 marks “Tanabata,” the Star Festival in Japan. Originally a part of Chinese mythology, the tale of Tanabata involves the romance of a young couple, the Princess star, “Orihime” or Vega, and the boy star, “Hikoboshi,” or Altair, who are separated by the two banks of the Milky Way and allowed to reunite only on the evening of July 7. Read More! If you weren’t already aware that ITT Tours, located in Schilling Recreation Center on Kadena Air Base, offers tours to exotic locales like Hong Kong, Bali, and Singapore, then it’s time to find out. If, however, a trip closer to home is more to your liking, ITT can also book you on trips throughout the Ryukyu Islands. Read More!